U.S. stocks rallied Friday, finishing a holiday-shortened trading week with all three major domestic equity indices reaching new all-time highs on June 1 and 2. Yet the U.S. dollar weakened and Treasury securities advanced along with gold after the May jobs report disappointed, showing the economy added just 138,000 new jobs, missing forecasts for 180,000. Annualized wage growth remained steady at 2.5%, while the headline unemployment rate declined to 4.3%, a 16-year low, as the labor force contracted. Bullish sentiment prevailed, however, as several strategists said the jobs data was still strong enough for the Federal Reserve to raise interest rates in June. Including dividends, global equities excluding the U.S. are outperforming the S&P 500. The MSCI All Country World Index Ex-US has risen 15.2% year-to-date (YTD) versus 9.9% for the U.S. equity benchmark. The MSCI Emerging Markets Index fell 0.13% last week, slightly trimming its YTD gain to 18.44%. For the week, the S&P 500 rose +1.01%, the Dow Industrials climbed +0.60%, and the MSCI EAFE (developed international) advanced 1.73%. Despite strength in consumer confidence, U.S. economic data, as measured by Citigroup’s “Citi Surprise Index,” has continued to come in below economists’ expectations. While slow real GDP growth for the first quarter (recently revised to 1.2% from 0.7% annualized) was thought to be a transitory event, it has since been followed by weaker-than-expected economic data early in the second quarter. J.P. Morgan notes that weaker data, combined with high U.S. equity valuations, suggest that a more thoughtful approach for equity investing may be warranted. While it is true that when compared to fixed income, U.S. equities are still relatively attractive, it is worth noting that there are still compelling equity stories outside the U.S. borders. 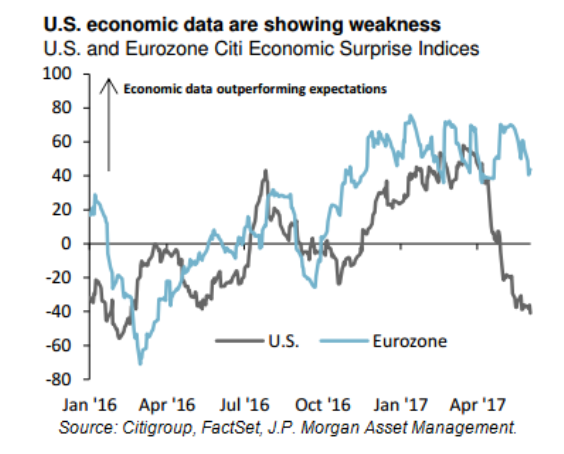 As shown in Chart 1, European economic data has been outperforming, both relative to expectations and relative to the U.S. Stronger European data, coupled with more attractive equity valuations and optimistic earnings expectations, make for a convincing equity opportunity in Europe. Given the current environment for U.S. equities – and economic data – it is increasingly important for investors to be positioned correctly, including being diversified both globally and across various asset classes.